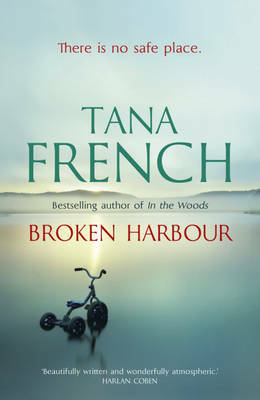 BROKEN HARBOUR is a very fast paced, unrelenting account of a short few days in the life of a murder detective trying to find out what happened to the Spain family, and has less of a psychological element to it that in some of her earlier books (THE LIKENESS or IN THE WOODS). It is written entirely in the first person, with Detective Sergeant Kennedy, a detective on the Dublin murder squad, recounting the facts (and his reactions and emotions) as he tries to solve the case. Moreover, he has a very high solve rate to defend, and a newbie Detective Garda (Richie Curran) as his partner, to show the ropes to. Both Jennifer Spain and her husband Patrick have been stabbed, and their two children, Jack (about 4 years old) and Emma (about six) have been smothered. Jennifer is still alive, just, and has been whisked off to hospital. The doors are all locked and do not appear to have been forced, no windows are open or broken. Is the murderer someone who managed to get in anyway, or is it a tragic family situation where the husband killed his children, tried to kill his wife and then took his own life? The Spains lived on a newly built estate in Brianstown, in a place by the sea originally called Broken Harbour (broken from the gaelic: Breacadh: daybreak). Originally planned as a luxury new build, the recession has meant that the builders pulled out early without completing the project, and the few completed and occupied houses have numerous problems. It has become a rundown and depressing place to live. The promised nearby shops and entertainment venues have never been built. In addition, the Spains were in financial difficulties, with Patrick having lost his job and the money fast running out. Perhaps those difficulties had lead to Patrick losing his mind, and carrying out the unthinkable, killing his family? However, there are too many odd observations that make it difficult to immediately draw this conclusion. The wiping of the browsing history and e-mail on the family computer at about the same time that the killings took place, and bloody footprints outside the house, suggest someone else was there. There are also large holes in the walls, and a wire mesh nailed into the hatchway into the attic, with a video monitor pointing at it. Why? Is some sort of surveillance going on and why? Kennedy has his own connection with Broken Harbour, as it was a place his family went to on holiday every year, until his mother committed suicide, by walking into the sea. At the same time as trying to solve the murders, he feels that he needs to protect his sister, Dina, from finding out too much about them. Dina was only 6 when her mother died, is clearly is a very troubled person, and Kennedy is worried by how this will affect her. And yet at the same time, she is very sensitive to her brother and his desperate attempts to find out what happened to the Spains, working gruelling 18 hour shifts to try to solve the murders as quickly as possible. Her reaction to the murders and his involvement keep Kennedy busy when he's off duty. The way in which Kennedy explains the procedures that need to be taken to his new untrained partner Richie, to maintain momentum, preserve evidence and solve the murder as quickly as possible, is very effective in engaging the reader in the whole process and in the story. Richie's perhaps somewhat naïve attitude also plays a key role, and he becomes a useful foil to the hardened "I've seen it all" but yet professional attitude of Kennedy. The threat of failure, and the desire of some of the other detectives on the squad to see Kennedy make a mistake also play a role in racking up the tension, as well as contributing to the plot development. The side story of Kennedy's sister and his own tragic past also eventually become an important part of the story, although this is the only part of the novel that didn't sit quite as well as the rest, and seemed somewhat manufactured. Nonetheless, this was an excellent book, where the tension racks up quickly to an exciting ending. A highly recommended read.